This is almost an absolute rule: if you look around your congregation and people are barely singing, there is something wrong with your worship services. I say almost an absolute rule because I suppose you could be church planting among unreached peoples and could have an exploratory service filled with non-Christians. But even for the best missionaries and evangelists, most people in the weekly worship service are Christians, even if they are baby disciples or new converts. So for 99% of us, the rule is absolute: the sound of worship on Sunday morning should be loud with the sound of the congregation singing. I guess our congregation must sing fairly well, because I often notice in other churches–actually, my kids notice first–that hardly anyone is singing. If this is a problem in your church, there may be several reasons why. 2. The music is poor. Not all music is created equally. Some tunes are catchy, easy to sing, and powerfully support good lyrics. Other tunes are too hard, too bland, too syncopated, too high, or repetitive to be used to good effect. 3. The music is played poorly. People have a difficult time singing with confidence if the musical leadership is not competent. They might choose the wrong instrumentation (e.g., drums for a lilting hymn or the saxophone for a triumphant anthem). Or the guitar may inadvertently switch a 3/4 song into 4/4 because he can’t figure out a different strumming pattern. And sometimes there is just too little energy, too little consistency, or too little sound (yes, the music can be too soft) to encourage congregational singing. 4. The aesthetics are not communal. Ideally, the sanctuary is laid out so that people can see other people. We are supposed to be singing, at least in part, to each other. Even if you can’t rearrange your pews, you can think about other factors. For example, the worship leader having a special moment with the Lord may not actually be helping anyone else to have a special moment. Likewise, turning the lights nearly off encourages a privatized experience. 5. You are using too many new songs. One new song a month is pushing it for the most skilled and change-appreciative congregation. Two or three songs in one week is terribly unwise. 6. The people are not taught to sing. Many churches would do well to provide remedial instruction in reading music, using a hymnal, and understanding one or two things about music composition and instrumentation. 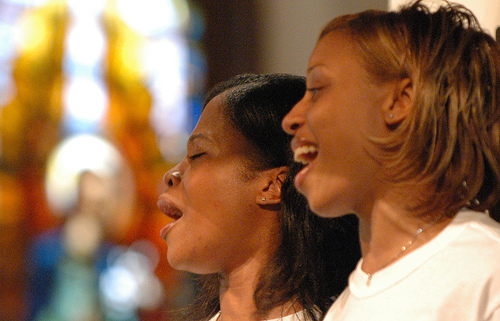 More importantly, congregations need to know the spiritual reasons why we sing and why they should sing (even if they are not musically gifted). 7. The worship leader has become a master over the congregation not a servant. I would never hire a music leader who thought the band, the organ, the choir, or his new song was more important the people singing heartfelt, biblical praises to God. It’s a service of worship, not a concert, a performance, or a showcase for your musical talents. 8. The service is not planned well. This can take many forms–too many songs in a row, too disjointed, too much standing, too much sitting, no attention to flow or dynamics. 9. The people are spiritually immature. This is not necessarily a bad thing. Like I said at the beginning, maybe you have a congregation of new converts. People have to start somewhere. But if week after week, month after month, and year after year, the congregation barely sings, it may be a sign that in their hearts they have nothing much to sing about. 10. The church leadership doesn’t care. If the pastor and worship leader are focused on numbers alone, or simply on the excellence of the band, the choir, or the organ, and not on the participation of the people, it’s no wonder Sunday morning is filled with the sound of congregational silence. We can do better. The Bible tells us to, and God will be pleased when we do. As will the congregation when they experience the joy of singing so as to be heard.